We design and establish customised investment vehicles for Greek and international investors. We manage them actively and in a performance-oriented manner from Chania in line with the investment objectives, closely liaising with our customers. In this way we discover new real estate investment opportunities and provide sound strategic advice to protect your interests during the process of the decision to acquire, manage or dispose of property. ARENCORES identifies investment opportunities, assesses and manages properties to increase the value of their associated assets and increase the return of investment (ROI). We consider ourselves to be a honest representative of the real estate investors: For our customers, we identify the “right assets and opportunities” and structure the entire real estate acquisition process, from property sourcing, research, due diligence and purchase agreement negotiations right through to the point of transmission to asset management. For private investors, corporate investors and companies with their own real estate portfolio, we unlock the potential of the real estate assets in Chania real estate market under investment management. We offer them a wide range of services across the entire real estate life cycle: from analysis and valuation, management and development right through to, branding and marketing. Our customers benefit from customised services and market intelligence tactics with focus on Chania real estate. Optimize your property value with a sophisticated Market Intelligence approach. ARENCORES is a best-in-class, full-service provider to investors across the entire life-cycle of real estate ownership. Through our market-leading network, our clients have access to proactive management professionals who understand Chania real estate market indicators and risks. We provide a full range of integrated services customized to each client’s specific needs in a flexible project delivery plan enhanced with a plethora of flexible project management synergies as well as acquisition and sales expertise. When a new investment is in the process of being established, those in real estate investment- development team work with the legal and compliance teams to make sure the investment vehicle meets all regulatory and legal requirements. ARENCORES team also works with the marketing and sales parameters to craft the promotional material for the new investment. Private Wealth Management (PWM) secures, develops and manages relationships and negotiations with investors, corporate investors and developers. Institutional Business works to develop and execute thoughtful investment solutions for our real estate customers which includes individuals, corporate and private investors, foundations, insurers and institutions. Third Party Distribution (TPD) primarily targets individual, investors and real estate developers through financial intermediaries and intelligence forecasting to identify high ROI opportunities. ARENCORES Intelligence (Ai) identifies real estate investment opportunities across a wide range or properties and under several criteria, market indicators and risk scenarios. The focus is to generate reliable and economically viable investment prospects. Do you want to lease or sell your property? Do you wish to buy a property or land? 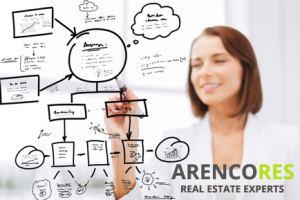 Do you want to learn more about ARENCORES real estate services? When you choose ARENCORES to sell your home we think you will find our approach refreshingly different. Why sell your property in Chania through ARENCORES? If you’d like to discuss your potential sale or receive a suggested marketing price, please complete the valuation request form or contact us. As a dedicated and well respected Chania real estate firm with extensive local knowledge, our experience will prove invaluable in your proposed sale. ARENCORES advises and guides sellers at each stage of the sales process in order to secure the optimum price for their property and within an acceptable time frame. If you are thinking of selling, we are happy to undertake a a property appraisal and advise on value, presentation and marketing.